The European Medicines Agency (EMA) has recommended Tagrisso (osimertinib) for approval for the treatment of adults with locally advanced or metastatic non-small cell lung cancer (NSCLC) with a specific mutation (T790M) of the epidermal growth factor receptor (EGFR). Osimertinib is an oral once-daily table intended for patients who have developed a mutation in the EGFR gene; such mutations of the EGFR gene may develop cancer and reduce the effect of EGFR-blocking medicines. As reported yesterday, the European Medicines Agency’s Committee for Medicinal Products for Human Use (CHMP) reviewed osimertinib under its accelerated assessment program and recommended conditional approval for the medicine. This is used to facilitate early access by patients to medicines that fulfil unmet medical needs. By granting conditional approval it allows the EMA to recommend a medicine for marketing authorisation before the availability of confirmatory clinical trial data, if the benefits of making this medicine available to patients immediately outweigh any risks related to the lack of comprehensive data. The safety and efficacy of osimertinib were demonstrated in 2 single-arm phase II trials involving a total of 411 patients with advanced EGFR T790M mutation-positive NSCLC whose disease progressed after treatment with EGFR-blocking therapies. Approximately 66% of patients responded well to the drug, with results of the trials indicating that their tumours had shrunk. Additionally, this appeared to be long-lasting effect, although the benefits in terms of progression free survival and/or overall survival have not yet been determined. The most common side effects of osimertinib are diarrhoea and skin and nail conditions such as dry skin, rash and acne. As part of the conditional marketing authorisation, the applicant for osimertinib must provide results from an ongoing phase III study. Until availability of full data, the CHMP will review the benefits and risks of osimertinib annually to determine whether the conditional marketing authorisation can be maintained. In Europe, in 2012, 313,000 patients were newly diagnosed with lung cancer and 268,000 people died from the disease, accounting for 1 in 5 cancer deaths. 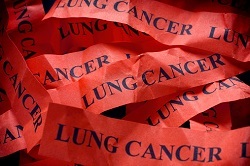 Approximately 80-90% of all lung cancers are NSCLCs, which occur when cancer cells form in the tissues of the lung. EGFR is a protein involved in the growth and spread of cancer cells. Despite progress in early detection and treatment, NSCLC is most often diagnosed at an advanced stage and the outlook for patients with the disease is poor. Once NSCLC has progressed to a locally advanced or metastatic stage, treatment is focused on extending life, delaying disease progression and improving symptoms and quality of life.